Berwick upon Tweed is the English town closest to the border with Scotland. Heavily fortified, it passed between English and Scottish ownership 14 times. The barrack house situated on the parade was built between 1717 and 1721, making it the earliest building of this type in Britain. It was constructed by the Board of Ordnance in the aftermath of the 1715 Jacobite Rebellion, when military sites were appearing throughout the country (notably Woolwich Arsenal and Chatham Naval Dockyard). 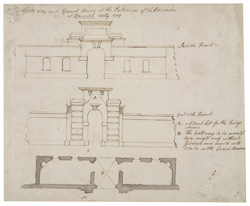 The barracks was originally designed by Nicholas Hawksmoor but his design was probably simplified.